Peterborough United and Victoria Beckham are squaring up for a fight over the right to use the nickname 'Posh'. The UK Patents Office confirmed that Victoria Beckham had lodged a counter-claim to the football club's application to register the nickname, 'The Posh', which they have used since the 1920s. But Peterborough chief executive Geoff Davey is ready for a battle - and warned that the club faced serious financial implications if they were prevented from using the 'Posh' name on merchandising. A statement from her publicity company said: "The name Posh is inexorably associated with Victoria Beckham in the public's mind." It added: "The concern from her team is that they (the public) would think she had in some way endorsed products she had no knowledge of. "Whilst Victoria accepts that the football club are nicknamed Posh, and might want to use the name in association with football products, there is no conceivable reason why they should need blanket coverage for every class of goods." Davey said: "I was absolutely stunned when I got the letter [confirming the counter-claim]. "Mrs Beckham's opposition alleges that since the launch of the first Spice Girls CD in 1996, she has been commonly referred to as Posh or Posh Spice. "She claims the nickname 'Posh' has become synonymous with her on a worldwide basis. "Although she has not registered the name 'Posh' or 'Posh Spice', it is alleged that 'Posh' is a well-known trademark, at least in relation to musical performances, printed publications, musical recordings and other licensed goods. "Our argument will be that Posh has been associated with the club since the 1920s." An impressed director eyeing up the players' appearance in their new kit said they looked 'Posh'. A former manager said he wanted "posh players for a posh team" to play at the club's new ground. "In 1998 we registered 'Posh' and 'The Posh' under the chairman's name," Davey told BBC Radio Five Live. 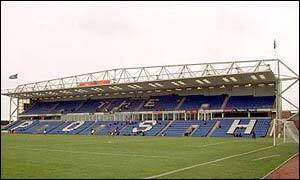 A Patents Office spokesman confirmed that Peterborough chairman Peter Boizot applied to register the club's use of the name in August 1998. Trademark registration rules say that any application must be advertised for three months. Peterborough's application was advertised in June this year, and a counter-claim was received in September. "I just hope it doesn't come down to who has got the most money," said Davey. Peterborough are currently up for sale, with a price tag of around �1.5m on the London Road club. "I was staggered to hear this"